La Grange is a stunning Converted Barn with large swimming pool consisting of 3 bedrooms, bathroom and separate shower room. The property is located in the beautiful village of La Forêt-de-Tessé in the Charente area of France. Features include a spacious lounge with galleried landing, large dining room and kitchen. It also boasts covered outdoor eating areas for barbecues and an amazing Moroccan garden with bar and seating area. La Grange has been converted and furnished to an extremely high standard. The lounge has a fireplace log burner, sumptuous leather couches and cobbled floor. A feature spiral staircase leads to the gallery and bedrooms. The large master bedroom is beautifully furnished with antiques and silks. The quirky twin bedroom is dominated by the oak beams giving a medieval ambience. Bedroom three has a single day bed which converts to twin beds. The main bathroom has a Victorian bath with shower, bidet, loo and wash basin. The shower room includes a loo and hand basin. The kitchen is fully equipped and includes a washing machine, dishwasher, double oven and fridge freezer. The dining room accommodates 6 diners comfortably and opens onto the stunning Moroccan garden. The illuminated garden and bar is an ideal place to sit and eat in the evening under the vines and olive trees. There is a gas barbecue and patio heater. Alternatively there is another relaxing eating area under cover overlooking the swimming pool. The main garden has numerous fruit trees and guests are welcome to help themselves to walnuts, apples, cherries and grapes if the birds haven't beaten them to it! please be advised there is a damage deposit OF £200 refundable after checkout. Thankyou Tony and Wendy for taking the time to write. We so enjoyed having you here and your return can't come soon enough for us. All our very best wishes for your future travels. 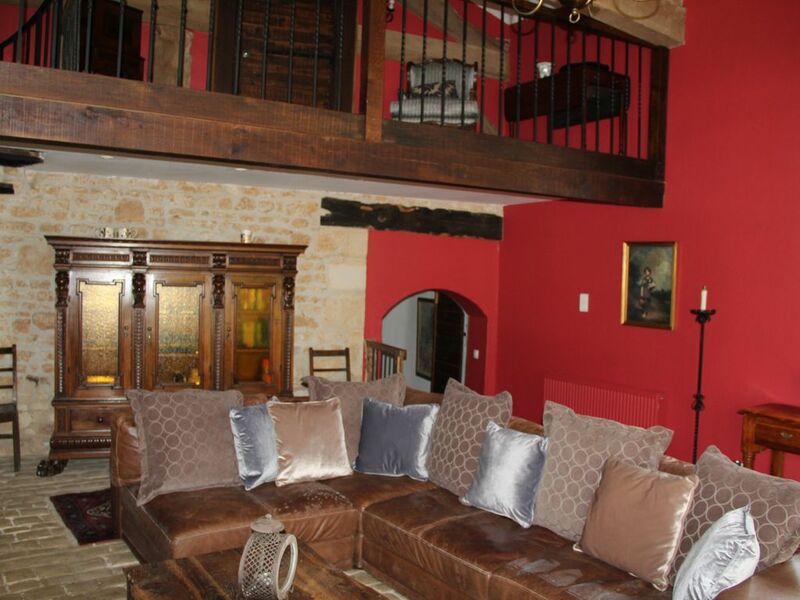 A beautiful barn conversion, perfect for relaxation. We had a wonderful stay at La Grange. Susan and Graham are lovely hosts, very friendly and helpful when needed, but not at all intrusive. The gardens are stunning, and make for a great place to relax and read a book. The pool is a great size and we all had fun swimming throughout the holiday. The Moroccan garden is a great place to enjoy an al fresco meal and our son had a great time pretending the bar was his "shop". The barn itself is immaculately presented and very well equipped, with everything needed to make our stay comfortable and it was easy to feel relaxed and at home. It is spacious and there was more than enough room for the three of us to spread out. When we could tear ourselves away we had some great days out, searching out the cartoons in Angouleme, visiting Chateau Rochefoucauld, the fantastic Futuroscope (a big hit with our son) to name a few. We would thoroughly recommend a stay at La Grange, a perfect place for families or couples to relax and unwind. Thankyou to a lovely family and we look forward to seeing you again sometime. We were looking for somewhere special to stay to celebrate several significant birthdays….This spacious house fitted the bill perfectly. There were 2 adults and 3 children (age range 11-18) and there was plenty of room for us all to spread out. The house itself is characterful, interesting and also has a lovely comfy feel to it so we felt relaxed right from the start. We found it very well equipped, both inside and outside areas spotlessly clean and tidy and with a generous welcome pack on arrival. It was such a bonus to have bikes provided and we used them to cycle most evenings along the quiet lanes after a BBQ supper in the Moroccan garden and bar. There were a number of different road loops that we walked, cycled or ran around during our stay and we also cycled to use a free (out of school hours) tennis court 3km away in the next village. When we could tear ourselves away from the inviting pool we found lots to do in the area; We took kayaks from Ruffec and paddled down the Charente to Verteuil, In Angouleme we took a free walking tour of the Street Art (Wall paintings), we went to Aubeterre sur Drone for a lazy lunch in the shady market square and then went to visit the underground church. In addition we found lots of local towns and villages to explore. In our view though it’s really the people that you meet that make a holiday special. Susan and Graham were perfect hosts; warm and welcoming, makings us feel at home at once, also thoughtful and generous throughout our stay. Nothing was too much trouble for them; even helping pack my brocante finds safely for the journey home! We would highly recommend this stay to couples and families alike and would certainly come back again in the future. Many Thanks for your very thoughtful & informative review which will be very helpful to future guests. We also enjoyed your stay and look forward to seeing you and the boys here again in the future. A beautiful property in lovely rural setting yet close enough to activities and shops. The owners have been fantastic; couldn't have been more helpful in recommending places to visit and supplying anything needed. The converted barn is immaculate inside and out with everything you need for a comfortable stay. A large property that comfortably housed 2 adults and 4 children. Children loved the pool and the surrounding gardens. 3 separate outdoor dining areas including bar and bbq, which was great for enjoying the weather! Bikes for use were an added bonus for rides along the quiet roads. We would highly recommend this property and hope to visit again soon. Thankyou so much for your glowing review. Being fairly new to renting, it's very reassuring and we are so pleased you've enjoyed your time here. We've also thoroughly enjoyed the couple of nights spent in your company. We stayed last June and couldn't wait to come back!! What a wonderful characteristic barn, set in a beautiful part of France. Our stay at Foret de tesse was fantastic. Staying with friends there was ample space for everyone. June can have mixed weather and we did but the barn didn't let us down. On the colder evenings we would relax by the Moroccan Garden or we would feast around a great meal with friends at the oversized dining table, cosy warm and welcoming. The hot days were spent by the lovely big pool with great sunbathing loungers and we had bundles of space to choose where we would have breakfast, lunch and dinner with candlelit barbecues and late night star gazing. Perfectly appointed with very comfy beds, we can't fault this place, a perfect peaceful getaway. Best part was the staff, however, it felt like we'd gone to stay with extended family in the heart of the French countryside. We couldn't have been made to feel more welcome by Susan and Graham. The facilities were brilliant, we even had bikes waiting for us and couldn't of enjoyed our stay anymore defiantly will be booking for next June and will recommend it to friends and family of mine! We enjoyed having you here and look forward to seeing you again next year. Many flea markets and antique markets are regularly held in several nearby villages. The historic and picturesque village of Verteuil-sur-Charente is a short car ride away with fine restaurants and beautiful riverside views. For extended family, we have a one bedroom gite accross the courtyard - please speak to us for rates.